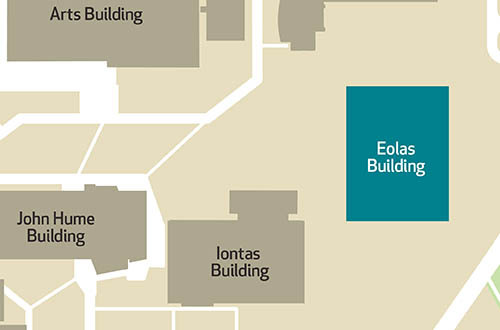 MaynoothWorks is located on the 2nd floor of the Eolas Building ​on the North Campus. MaynoothWorks business innovation centre (BIC) supports a vibrant community where entrepreneurs develop their ideas and maximise their company’s potential. As companies journey through the different stages of development, MaynoothWorks BIC provides a range of business supports and a mix of flexible facilities including bright modern offices, hot desk space, wet labs and meeting rooms. MaynoothWorks’ unique company assessment and intervention tool, the Balanced Innovation Model (BIM) underpins a mentoring approach, providing founders with the essential insights necessary to successfully navigate through the various challenges facing them. MaynoothWorks mentors and guides clients as they attempt to bridge their technology gaps. It opens pathways to skills and knowledge within the university and facilitates access to research funding. This holistic approach to business supports helps drive innovation and increases the opportunity for success. MaynoothWorks partners with University of South Florida and the European Space Agency widening client interactions and opening access to different ecosystems to better drive innovation. MaynoothWorks BIC is conveniently located just off the M50, which appeals to innovators looking to avoid the daily drudge of commuting into Dublin city; making it easier for companies to attract highly skilled staff seeking out a better work/life balance.